Forged In Fire Inspiration comes to Montegrappa from a variety of sources, places, events and objects. All celebrate some aspect of life, and what enriches it. In the wake of the great success of the Mule line, inspired by a famous cocktail, they looked again at another favourite tipple, the Blue Blazer. An enticing mix of scotch, boiling water and powdered sugar, the Blue Blazer earns its incendiary name from the theatre that accompanies it: the drink is set alight. Celebrating its 155th birthday this year, the Blue Blazer is said to be the first cocktail to undergo the touch of the flame. Most distinctively, the drink is prepared with two large tankards, between which the stream of flame travels. Our Montegrappa Blazer is based on the Fortuna shape, but with its cap and body made, appropriately, of fire-burnished stainless steel with a vintage-looking brushed silver trim. The polished steel surface of the pen barrel and cap basks in bluish, iridescent shades, just as a heated metal would do. Available as a fountain pen, rollerball and ballpoint, the fountain pen*s nib is made in steel and carries Montegrappa*s filigree etching, offered in the writing grades of Fine, Medium and Broad, and is converter or cartridge-fed. Converter is included. As a companion to the Mule, the Montegrappa Blazer will appeal to those who value authenticity, craft and a good, stiff drink. To assist in this pursuit, every Blazer pen will be delivered with a special Blazer tankard as a gift, as is traditionally used to prepare the drink and customized with the new logo. Celebrating even further the joys of the Blazer is our new, Italian spin on the classic, made with grappa, sugar, cinnamon and orange essential oils! BONUS!!! 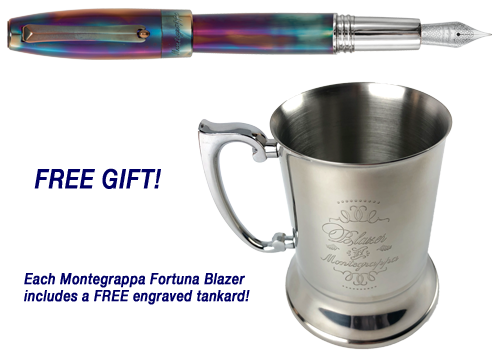 EVERY MONTEGRAPPA BLAZER PEN WILL BE DELIVERED WITH A SPECIAL BLAZER TANKARD AS YOUR FREE GIFT!! !